Drumlin Business Services provides internet related services to small and medium sized businesses as well as to individuals and clubs. Our aim is to provide you with the tools you need to make the most of the Internet. From hosting, to website development, through to email newslettters and mass email campaigns we can help you achieve your goal. We have a competitive and comprehensive system which, unusually in the web hosting world, includes giving you access to databses on all our hosting packages. We compliment this by providing 1 click installations for most of the popular database driven applications out there, including Content Management Systems, eCommerce systems and Forums. Find out more on our Fresh Web Hosting site or for a brief overview see the panel below. We offer a complete website design service. Our aim is to take your requirements, and work with you to produce a design you are happy with. We look after getting a domain name and hosting for your site. Your site will be loaded to the internet and you will have access to an administration panel to allow you to change and modify website content - including adding news items - without having to rely on a third party. Should you wish to design your own website, we have a full website templating service - you can choose a design you like and provided you have access to the appropriate software you can modify the design to your requirements. Visit Fresh Web Templates for more information. Again we offer a do it yourself or managed service. We provide our email marketing services in partnership with Constant Contact. Visit Constant Contact to have a look at the services available. Feel free to sign up for their trial. If at any stage you would prefer a managed service just contact us and we will be happy to discuss your requirements. For details of our managed email marketing service see the panel below. Our web hosting packages start at only £2.79 per month. You can also purchase domain names or transfer domains you already own to your hosting. To get started visit Fresh Web Hosting or if you prefer contact us and we will set up your hosting for you. For more information read our Website Design services page. 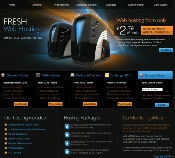 Our Website Template site offers thousands of templates across the full range of template types. Find out more on website templates. * Only available on websites hosted on our web hosting site. We offer a email marketiing and event marketing services in partnership with Constant Contact. You can manage your email marketing and event marketing activities by yourself through the Constant Contact interface or you can avail of our 'Managed Email Marketing' service.